We have a great new song to inspire you at Scrap it with a Song this week! In honour of the US Presidential Elections this week, we are singing along to "Our Country" by John Mellencamp. No matter what your political affiliations - this is just a great song about having pride in the country in which you live! I used a great sketch by Kristine Davidson. The background papers are both from the CTMH Cruisin' collection and the banners are from the CTMH Superhero collection, both retired. I also used some CTMH cranberry buttons (retired) & black waxy flax, CTMH black striped grosgrain ribbon, some Cranberry cardstock to matte my photos, the CTMH Small Chocolate Alphabet stamp set and cranberry ink, some American Crafts Thickers, and a journalling spot from my stash. Hope you'll play along with us this month. How do the lyrics of "Our Country" inspire you? Share your creation with us by linking up at Scrap it with a Song before November 30th and you'll be entered into our prize drawing, and may be picked as one of our November faves!! What a great page and I love the perfectly positioned buttons. Oh how pretty! 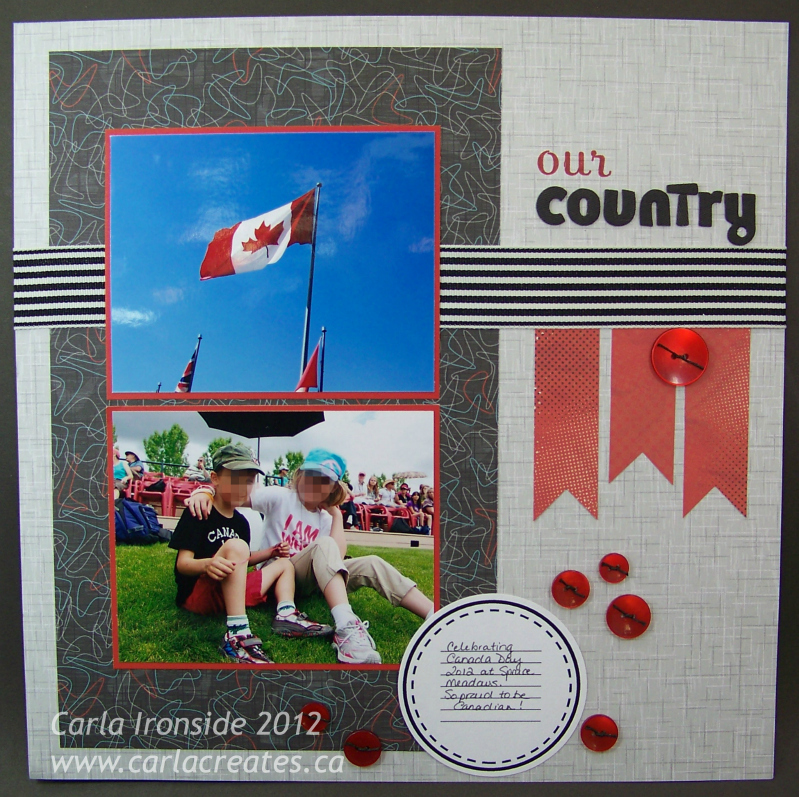 The colors are so nice with your photos - that paper pack is just right! The details on the layout are very good, too! Nice work!